I gotta hand it to the Des Moines Music Coalition. 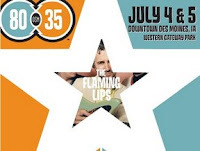 Last year, they set off to organize the 80/35 music festival, a big-time fest in the city where two major interstates meet. Despite being well funded, I was skeptical they could land a great national act. I was wrong. A limited number of pre-sale tickets go on sale Friday, April 18 for the discounted price of $40 for a two-day pass at IowaTix.com. General ticket sales begin May 1st with two-day passes at $50 and single day passes at $30. Day of show pricing is $35 for single day or $60 for a two-day pass. Seems like the discounted ticket is the way to go and you can count on my purchase. More bands to be announced so stay tuned!